Ohmigosh, you guys, my Mickey party was AWESOME! The weather held out, luckily, so we got to go to the park rather than Plan B – something Grammy Boo and Mommy were both relieved about. Do you want to see some pictures? If you don’t, ummmm, sorry – too bad. My blog – and I have TONS of pictures. Mouse-ka-ready? Mouse-ka-set? Here we go! 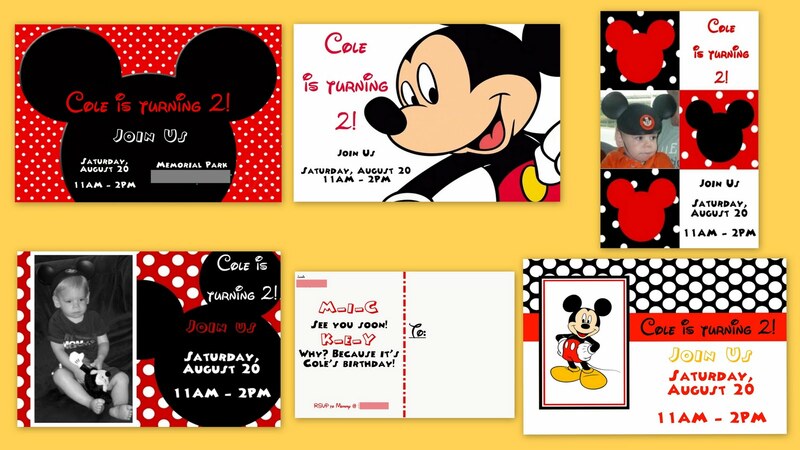 We sent out our invitations about a month ahead of time – Mommy, apparently, feels the need to make everything way more complicated than it has to be, so we had 5 different postcard designs. The center on the bottom is one of the back sides – they were all pretty much the same, but the reds matched the colors of the front design for each postcard. Mommy and Daddy stayed up late into the night on Friday getting the final details ready, even after Grammy Boo and Coach were pressed into service earlier in the evening. I’m lucky to have so many people willing to make this a perfect day for me! This table held the beverages and the paper goods; the beverage dispensers were filled with “Clubhouse Punch” (1/2 juice & 1/2 water), “Minnie’s Pink Lemonade” (sugar free), and “Oh Toodles Iced Tea.” Those water bottles that Cousin Meredith helped label were in the ice bucket on the right. 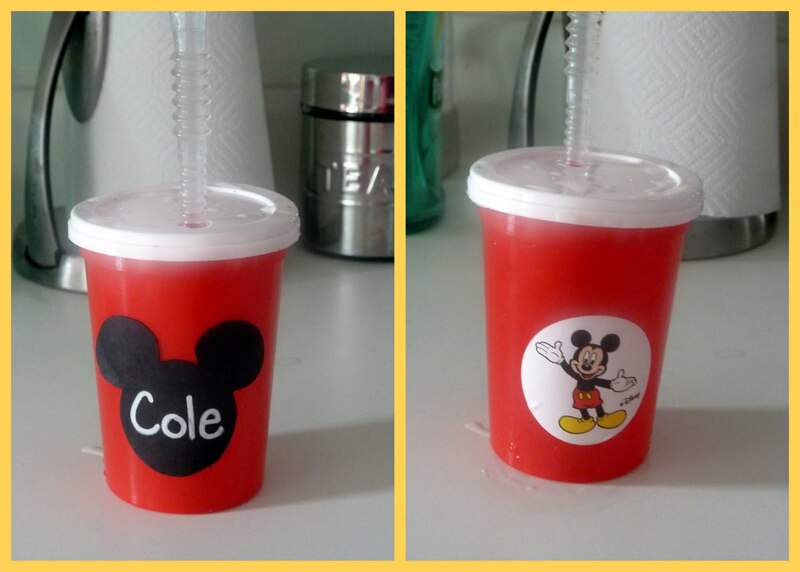 For the kids, we had straw cups that Mommy personalized with Mickey silhouettes and everyone’s name. Grammy Boo and Coach helped put the Mickey stickers I got in Disney World on the back of them. Max was ready to dig in. We also had rainbow fruit skewers that Daddy stayed up late to make to Mommy’s exacting specifications. Next time, he prefers if we just have fruit salad… Also, you can see one of the center pieces. The big Mickey in the center is painted styrofoam balls on a dowel, and then there was floral foam in the bucket to anchor the cakepops, and paperfill on top. Mommy put those Mickey cookie cutters to good use and made Mickey shaped rice krispie treats, which we did not get a good picture of – oops. Also on the dessert table was the cake. It deserves a second look, right? Didn’t it come out amazing?! AND, unlike many gorgeous cakes, it tasted absolutely delicious! Mommy’s friend, Melissa, is amazingly talented. She made the cakepops for our New Years at Noon party, too, and once again everyone was *raving* about the baked goods! Melissa owns Mom & Pops, and you can see more of her creations on her Facebook page. Even if you’re not one of my local friends, you should check her out – she does dairy and gluten free confections, too, AND she ships! Luke (my Music for Aardvarks teacher) was, unfortunately, busy on Saturday so he sent his friend Max to play music for us. Remember how I said I got up super early? By the time Max got started, I was SUPER cranky, but everyone else had a great time! I only have pictures with camera-shy friends in them, so you’ll just have to take my word that it was fun. After the music, we had lunch – and a cakepop gave me a second wind. Also, I finally got my hands on the Mickey balloon I’d been coveting, so I was in a better mood to blow out my candles. Should we take a look at my party ensemble? I only deigned to wear my Mickey ears to blow out my candles, but I LOVE the shirt Mommy got me. The two year molars busting through my back gums also contributed to my crankiness. Patty at Tutu Cute Creations made my shirt and it is my new favorite – Mommy let me try it on when it arrived and I didn’t want to take it off! After cake, I played on the playground with Grandma, Grandpa, Uncle David, Aunt Angela, and Aunt Rebecca. I was having so much fun, I outlasted *everyone* and played right through nap time; by the time we got home, I was EXHAUSTED. It was so nice to see most of my family and friends all in one place (we miss Uncle Matt! ), and I had a great day. AND, my actual birthday is yet to come (Wednesday) – we’re going to the beach AND then we head off to Rocking Horse Ranch for a few days next week. This summer has been pretty awesome start to finish! How fun!!! LOVE that cake! Awesome party!!! You put a lot of work into it. Thanks for mentioning Mom & Pops! Yay yay yay you remembered the pictures!!!! It looks like a great time! Your mommy is so creative and obviously put a lot of hard work into your party – which shows because it all came out GREAT!!!!! Cole in Mickey Ears kills me every time! Happy Birthday Cole! Looks likes such a fun party. Your Mickey ears are adorable, as were all the details for the party! Happy birthday Cole! Love the theme, the decorations, that cake & fruit look awesome. Sounds like it was a great day. Looks like a ton of fun! Glad that the weather held out for you! Happy Birthday Cole!!!! Oh Cole, your party puts my daughter's Mickey party to shame ;)! We got a Mickey cake, cups, napkins, plates and homemade cupcakes but that's about it. Your mom is a fantastic party planner! What a cute party. I loved the invitations and the cake. Sooo cute! !